In ancient times the headboard were used to make the sleeping man safe from cold air! Wood just colds less than bricks and stones so wooden headboards were mostly used to make the whole bedroom interior insulated! Now we have gas heaters and electrical heaters to keep always our bedroom warm and cozy but headboards are still popular and are considered valuable for bedroom accent purposes! It really plays a leading role for aesthetic features of your bedroom and gives a plenty of ways to decorate more you bedroom to look whimsical, fanciful and heavenly! 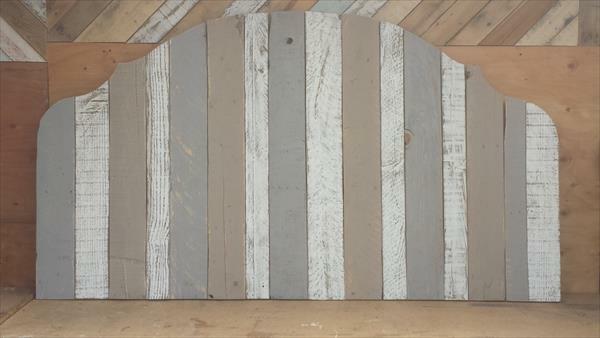 Checkout this DIY pallet king size headboard, has an artistic shape due to amusing rounded edges! Jointing the separated apart pieces of pallets, this brilliant design of headboard has been achieved and has been painted in shell beach color scheme for stunning and sensational hue! Just select your own favorite colors to get the look that suit best to your bedroom and try to finish it with stain and with a wooden sealant to create lasting longer stability to it!